She got up and put on some more substantial clothing. "Might as well take advantage of the current situation," she thought. 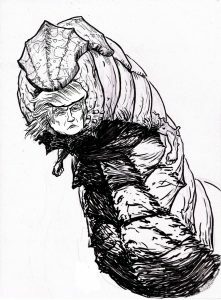 She had been declared a Freewoman, and could go anywhere she desired, and the God Emperor told her she could stay in His palace until she wished otherwise. Her quarters were luxurious, food superb, and she had servants at her beck and call, so she saw no reason to go anywhere else. As much as she had hated Trump from before His Apotheosis, she couldn't muster any real ill feelings for Him now. He was being very gracious, and He definitely wasn't the actual cause of the ruin of her political career. That would be the star she attached her wagon to, the star that turned into a big rock falling from the sky and plowing into the dirt. So the rumors of her predecessors getting angry enough at Trump to try assassinating Him were completely mysterious to her. She opened the chamber door and was startled by a tall figure standing close to it, wearing a plain white gown. She was even more shocked to see he... she?... wore what looked like a smooth flesh-colored mask and pulled-back hair. "Follow me," he said quietly - Hillary decided to think of it as male, give its height. She reluctantly fell in behind him as they headed toward an elevator. They entered, and he touched a sensor pad. The elevator began a long descent. A long awkward silence followed. She decided to break the ice. "I'm afraid I've never seen you around here. Are you a servant of the God Emperor?" He turned around to face her with his unsettling mask. "Not... quite. I knew Trump before He took the throne. I was even a good friend of His." She was taken aback by his use of Trump's name, instead of the customary title. "You... knew... Trump?" "Yes, as a matter of fact, Hillary, I remember the time you ran for President of the United States against Him." "That was almost ten centuries ago! How could you... Are you a ghola too?" "No, no, no. I helped develop the medical technology for gholas, though. It happened to be the same technology that let me be a shapeshifter. I am as immortal as Trump, but like Him, I gave up my humanity to be so. But I didn't do it originally to live forever. I did it to become a woman. For the second time. And the third time, and finally to surpass gender altogether." Hillary felt disoriented from the emotional disturbance. "Bruce? Caitlyn?" "I am known merely as 'Jenner' now." She suddenly realized he wasn't wearing a mask. It was his real face. The elevator slowed its downward path, then stopped. "OK Hillary, let's go see what you need to see."